Practice is a very important part of learning music. A common reason for students discontinuing lessons is because practice at home is not working well. 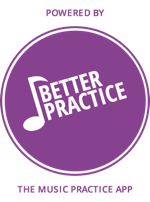 We want you to be successful, so we use a modern practice tool called Better Practice that makes practice easier, smarter and more fun. It puts everything you need to practice at your fingertips, including the teacher!